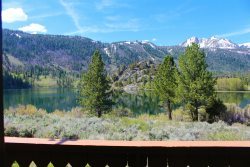 Book this vacation condo in June Lake, the heart of the High Sierra. On the shores of Gull Lake, next to June Lake and plentiful trout. Great winter skiing. Come relax in June Lake at the Interlaken vacation condominiums. Get inspired by an alpine retreat. June Lake sits at 7,500 feet and is surrounded by lakes and the stunning Sierra Nevada Mountains. For generations this town has been the perfect vacation destination, and it soon will become yours! Guest Review: "This condo felt as comfortable as home and I fell in love with the views." June Lake offers something for everybody like fishing, sightseeing, skiing, or simply relaxing at June Lake Beach. The trout are plentiful in June Lake, Gull lake, Silver lake, and Grant Lake. Summer offers fishing, boating, paddle boarding, swimming, biking and hiking! All hiking abilities can hike in June Lake. Take a stroll around Gull Lake or get out in the back country to access famous trails like the Pacific Crest Trail or John Muir Trail. Knowing that only a small group of people get to see the pure, untouched beauty of the back country makes it simply breathtaking. June Lake and surrounding areas are also well known for fall colors, something not to be missed. Aspen trees turn to gold and orange which make a stunning backdrop. When the snow starts to fall, the June Lake Interlaken Condos are only a two minute drive to the June Mountain Ski Area. This ski area is great for kids, beginners, powder chasers, and back country skiers. Also Mammoth Mountain Ski Area is only 25 minutes away! June Lake is an ideal central location is you want to explore more of the Sierra Nevada. There is Yosemite National Park, Bodie State Park, Devils Postpile, and the mysterious Mono Lake. At the end of the day come home to your Interlaken Vacation Condo and relax on your deck watching the sunset over the lake and mountains. Enter this top story condo and find the room on your left. The bedroom has a King bed, 32" TV and a fully attached bathroom. Down the hall is a wet bar, the washer and dryer, and the fully equipped kitchen. There is seating at the counter for three, and a dining room table with 4 very comfortable chairs. From the kitchen look out to great room and the spectacular lake and mountain views. The great room has a wood burning fireplace,48" flat screen TV, VCR, Cable, wireless internet, and plenty of comfortable seating. From the great room there is a deck looks out to the lake with some patio furniture. we've stayed multiple times and will stay again. Great staff, nice condo but hot tubs and maintenance of exterior of properties could use some work. Other than that we had an excellent time and would definitely stay again. It was warm and cozy and we enjoyed it! Customer service was great from beginning to end of our stay, very friendly and willing to listen. Although Interlaken property #38 could use a few minor cosmetic and appliance updates, our overall stay was excellent! We absolutely loved the view of the Lake from the condo's rear balcony, and the close proximity to the Gull Lake Marina and June Lake loop. We will definitely be going back. The staff was very helpful and friendly. Made it easy for us. We really enjoyed our stay so much we were considering booking another night. The place was cozy and had everything we needed. The view..it was by far the best part of the property!!! we enjoyed it. will come back. I have used your services for at least a couple of years now and it is always so pleasurable. The fact that you accommodate for early check in when possible really helps us out since we often drive up from Los Angeles through the night. I will be back in a couple days to do it all again. Thank you so much! Team was terrific: knowledgeable and friendly. Stay was great, only suggestion would be to ensure better lighting. Few missing light bulbs. Would highly recommend soft whit LED bulbs throughout the house. They are fairly inexpensive, last forever, provide the right type of lighting for the unit, and considerably more cost effective than incandescent or CFL BULBS. I would like to stay again ( 2nd weekend of October) for my dons birthday. Would prefer the same unit if possible. Please advise when able. Thank you and happy new year. Like the location but will look for another unit in the same complex. The Interlaken condos have the best view we have ever experienced in a rental. We could sit all day and just watch the changing light on the lake and the mountains. Even in the rain it is beautiful. Staff was friendly, knowledgeable and responsive. When I sent an after-hours email same day about my arrival time, they responded with clear directions and set my anxiety at ease. Wonderful experience. Our 4 day stay at Interlaken rivaled our 10 day stay last summer on a private beach in Kauai. The relaxation and time we were able to spend outdoors with our children in the middle of some of the most spectacular scenery made it one of my favorite and most memorable vacations ever. The unit was very clean the location was beautiful most of all the VIEW was breathtaking . We had a wonderful and relaxing stay, spending more time than I expected on the deck, or walking around Gull lake. Smooth transaction, the experience was great. We have stayed at the property several times over the years. It has always been great which keeps us coming back year after year. The views of the lake and Carson peak are amazing! I want the best view you have...That's all I had to say, and they did the rest. A phone call on our way up confirmed our arrival and an envelope on the door had a map and a key, what could be easier? Interlaken 38 was everything they said it would be. We have to readjust our expectations on what a view is now. Thank You! The view was worth every step! fantastic, except for all the stairs i had to climb MANAGERS RESPONSE: We have other units at Interlaken with less stairs. Contact us for your next visit and mention the stairs so we can put you in a more suitable unit. Thanks!